Knorr Carbonara Sauce Mix is a tasty western sauce and easy to prepare. 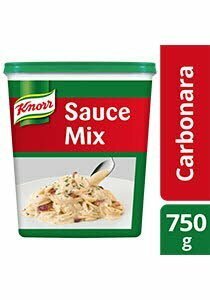 Knorr Carbonara Sauce Mix is great to be served as a pour over on pasta, meats and vegetables. Add milk or cream for richer taste. All food additives are of plant and synthetic origin. May contain traces of cereals containing gluten, milk, fish, crustaceans, mollusc, peanut and tree nuts. 1. Dissolve 230g of KNORR® Carbonara Sauce Mix in 1L of room temperature water. 2. Bring mixture to the boil with frequent stirring and simmer for 3 minutes, the remove from heat. 3. Use sauce as it is, or as a pour over sauce for pasta, meat and vegetable. Add milk or cream for a richer taste. Close lid tighhtly. Store in cool dry place.